To see diagnostics and metrics in action, you need a VM. First, create a resource group with az group create. The following example creates a resource group named myResourceGroupMonitor in the eastus location. As Linux VMs boot, the boot diagnostic extension captures boot output and stores it in Azure storage. This data can be used to troubleshoot VM boot issues. Boot diagnostics are not automatically enabled when you create a Linux VM using the Azure CLI. Before enabling boot diagnostics, a storage account needs to be created for storing boot logs. Storage accounts must have a globally unique name, be between 3 and 24 characters, and must contain only numbers and lowercase letters. Create a storage account with the az storage account create command. In this example, a random string is used to create a unique storage account name. When enabling boot diagnostics, the URI to the blob storage container is needed. The following command queries the storage account to return this URI. The URI value is stored in a variable names bloburi, which is used in the next step. Now enable boot diagnostics with az vm boot-diagnostics enable. The --storage value is the blob URI collected in the previous step. In the Azure portal, select Resource Groups, choose myResourceGroupMonitor, and then select myVM in the resource list. To see how the host VM is performing, select Metrics on the VM window, then choose any of the [Host] metrics under Available metrics. In the Azure portal, choose Resource Groups, select myResourceGroupMonitor, and then select myVM in the resource list. Select Diagnosis settings. In the Pick a storage account drop-down menu, if not already selected, choose the mydiagdata account created in the previous section. Select the Enable guest-level monitoring button. To see how the VM is performing, select Metrics on the VM window, and then select any of the [Guest] diagnostics metrics under Available metrics. In the Azure portal, select Resource Groups, select myResourceGroupMonitor, and then select myVM in the resource list. Select Alerts (classic), then choose to Add metric alert (classic) across the top of the alerts window. 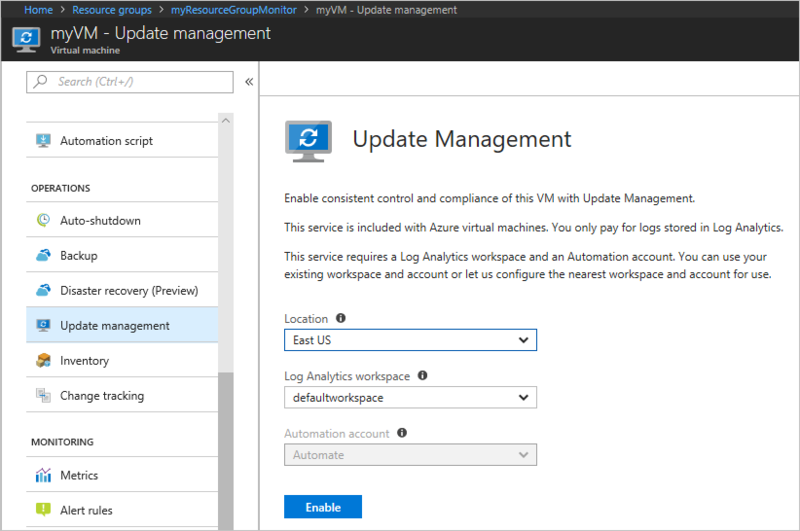 Update management allows you to manage updates and patches for your Azure Linux VMs. Directly from your VM, you can quickly assess the status of available updates, schedule installation of required updates, and review deployment results to verify updates were applied successfully to the VM. On the VM screen, in the Operations section, select Update management. The Enable Update Management screen opens. The validation process also checks to see if the VM is provisioned with the Log Analytics agent and Automation hybrid runbook worker. This agent is used to communicate with the VM and obtain information about the update status. Choose the Log Analytics workspace and automation account and select Enable to enable the solution. The solution takes up to 15 minutes to enable. The Update Management screen opens. Configure the location, Log Analytics workspace and Automation account to use and select Enable. If the fields are grayed out, that means another automation solution is enabled for the VM and the same workspace and Automation account must be used. 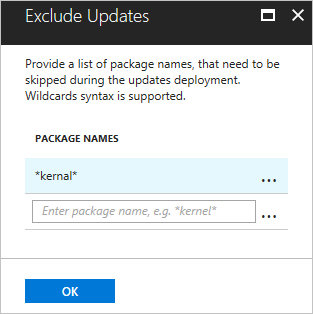 Updates to Exclude - You can provide a list of package names that should be skipped during the update deployment. Package names support wildcards (such as, *kernel*). Schedule settings - You can either accept the default date and time, which is 30 minutes after current time, or specify a different time. 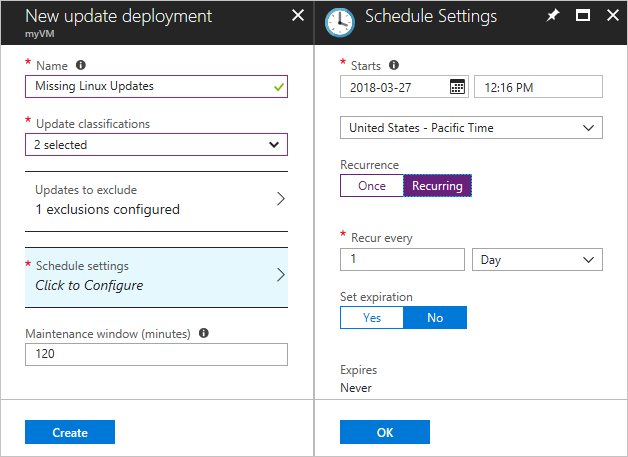 You can also specify whether the deployment occurs once or set up a recurring schedule. Select the Recurring option under Recurrence to set up a recurring schedule. After you have completed configuring the schedule, select Create button and you return to the status dashboard. Notice that the Scheduled table shows the deployment schedule you created. After the scheduled deployment starts, you can see the status for that deployment on the Update deployments tab on the Update management screen. If it is currently running, it's status shows as In progress. After it completes, if successful, it changes to Succeeded. If there is a failure with one or more updates in the deployment, the status is Partially failed. Select the completed update deployment to see the dashboard for that update deployment. Select All logs to see all log entries that the deployment created. Select the Output tile to see job stream of the runbook responsible for managing the update deployment on the target VM. Select Errors to see detailed information about any errors from the deployment. On the VM screen, in the Operations section, select Inventory or Change tracking. The Enable Change Tracking and Inventory screen opens. Configure the location, Log Analytics workspace and Automation account to use and select Enable. If the fields are grayed out, that means another automation solution is enabled for the VM and the same workspace and Automation account must be used. Even though the solutions are separate on the menu, they are the same solution. Enabling one enables both for your VM. After the solution has been enabled, it may take some time while inventory is being collected on the VM before data appears. On your VM, select Inventory under OPERATIONS. On the Software tab, there is a table list the software that had been found. The high-level details for each software record are viewable in the table. These details include the software name, version, publisher, last refreshed time. The chart shows changes that have occurred over time. 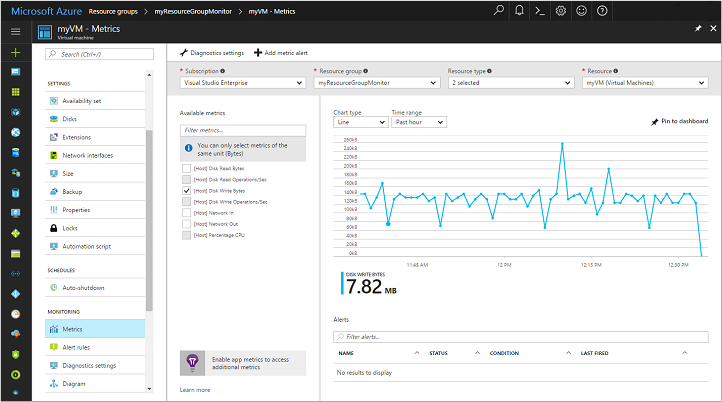 After you have added an Activity Log connection, the line graph at the top displays Azure Activity Log events. Each row of bar graphs represents a different trackable Change type. These types are Linux daemons, files, and software. The change tab shows the details for the changes shown in the visualization in descending order of time that the change occurred (most recent first). 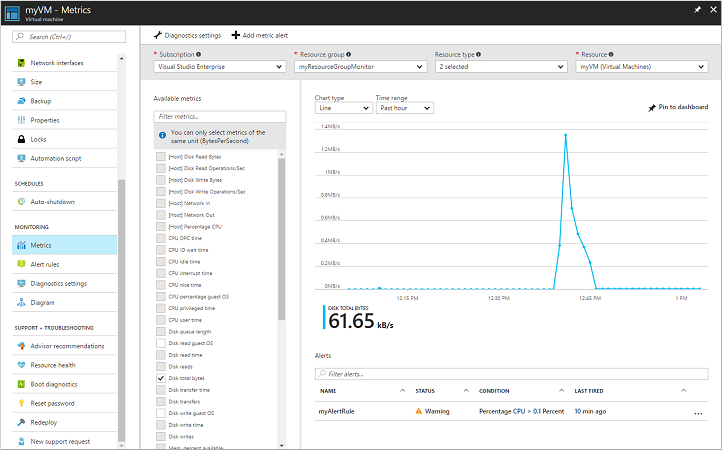 You can do more advanced monitoring of your VM by using a solution like Azure Monitor for VMs, which monitors your Azure virtual machines (VM) at scale by analyzing the performance and health of your Windows and Linux VMs, including their different processes and interconnected dependencies on other resources and external processes. 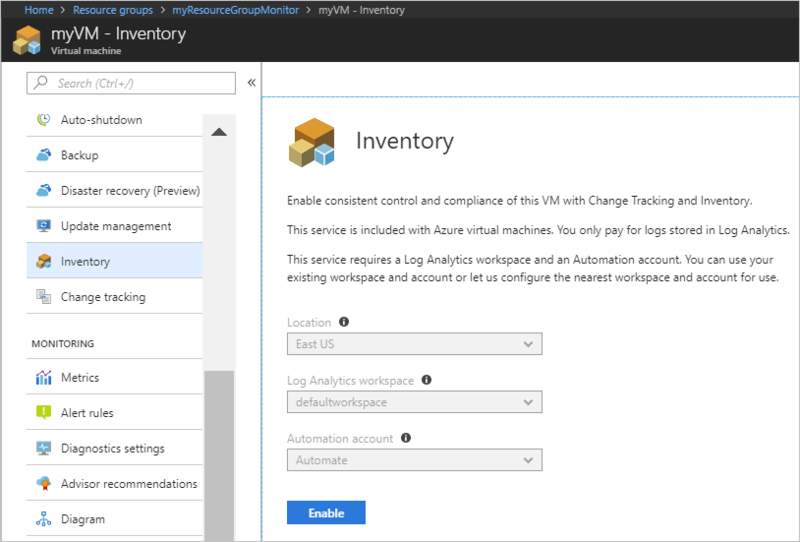 Configuration management of your Azure VMs is delivered with the Azure Automation Change Tracking and Inventory solution to easily identify changes in your environment. Managing update compliance is provided with the Azure Automation Update Management solution. From the Log Analytics workspace the VM is connected to, you can also retrieve, consolidate, and analyze collected data with the rich query language.